Colonial Americans drank. A lot. 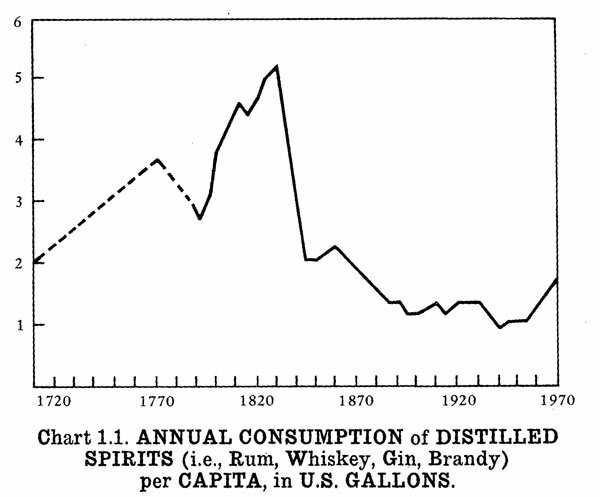 These charts come from The Alcoholic Republic: An American Tradition by W.J. Rorabaugh, an analysis of how totally trashed we were in Colonial times. In 1770, the average per capita intake of distilled spirits (whiskey, rum, gin and brandy) was 3.4 gallons; by 1830, the per capita intake exceeded 5 gallons.. The average adult male was imbibing half a pint of spirits per day. 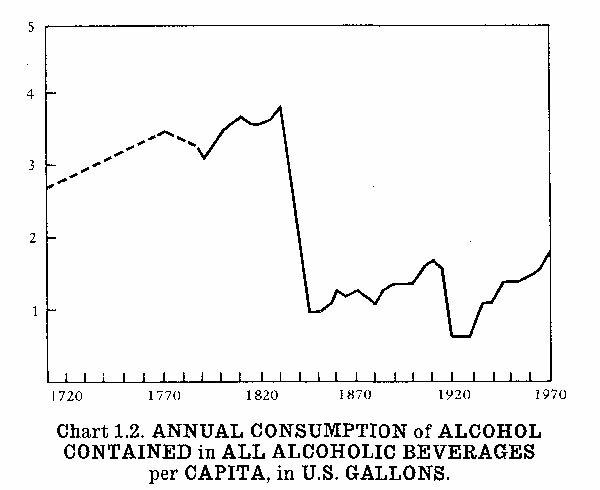 When you see the chart take a dip in the 1840s, that’s the temperance movement. Today, we clock in at under two gallons per capita. I also think it’s interesting that the total amount of alcoholic beverage we consumed dropped during prohibition; but the consumption of spirits rose. Bathtub gin was the drink of choice. I’ve found Rorabaugh’s account of drinking in early America inspiring. Tomorrow, I plan to drink the quantity of alcohol commonly consumed during the course of an average day in Colonial America. I plan to imbibe beverages appropriate to the time period: bitters, hard cider, brandy, whiskey and rum; served up in period appropriate drinks. And I’m going to follow the schedule of a Colonial drinker, from an “eye-opener” before breakfast, to a tankard of hard cider beside the fire at night. And I’ll be live blogging every step of the way. Check back through the day to see how I’m progressing. Amazing. Cannot wait for this and hoping for some recipes along the way! Love this! hilar.. see how we got to where we were? founding fathers were schwasted. Haha! What a totally great idea, and an interesting topic to explore. I’m really looking forward to to your live blogging tomorrow. Or should I say… drunk blogging. Love it! Hope it’s fun! Thanks for the well-wishes, all! A Night of Passion in a Museum – no not that kind – For the Love of Writing…!